The iconic regional speciality food of the North East corner of Scotland has got to be the Buttery. Depending on where you're from you might call it a Rowie or an Aberdeen Roll. Terry Wogan caused outrage when he branded the local delicacy as tasting “like a mouthful of seaweed”. If you've never tasted one and haven't a clue what I'm on about, listen to me and not Mr Wogan. They can best be described as a dense, round, flaky, flattened, buttery, salty kinda croissant! They were originally made for Aberdeen fishermen who needed a roll that would not become stale during the two weeks plus that they were at sea. The high fat content, traditionally from lard, also meant they provided an immediate energy boost. 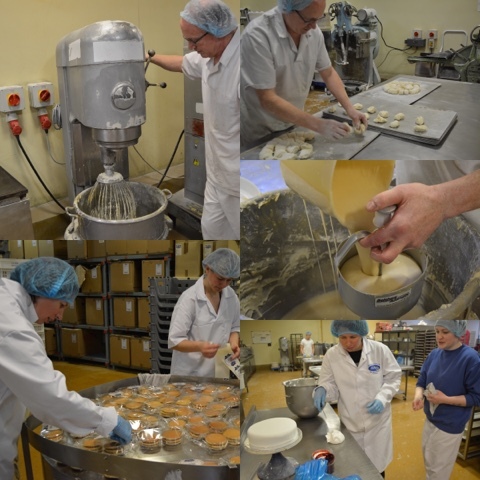 When I was offered the opportunity to be a baker for a few hours as part of the celebrations for Craft Bakers Week I jumped at the chance to visit the JG Ross headquarters in Inverurie and try my hand at buttery making. The general consensus of most Aberdonians is that they are made purely of lard, salt and calories! Would their secrets be revealed?! 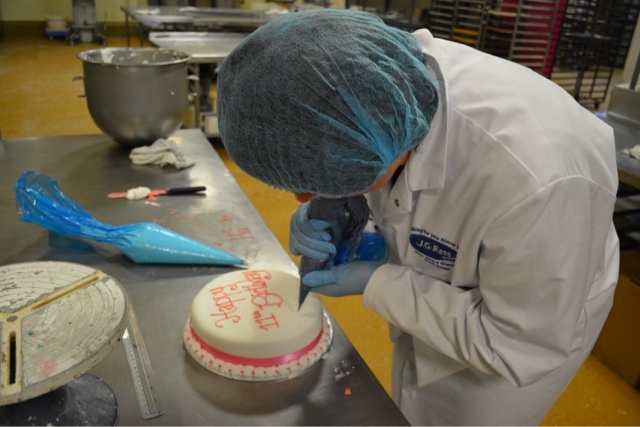 For the past fifty years, craft baker JG Ross has been servicing the bakery needs of the North East of Scotland and beyond with baked goods. 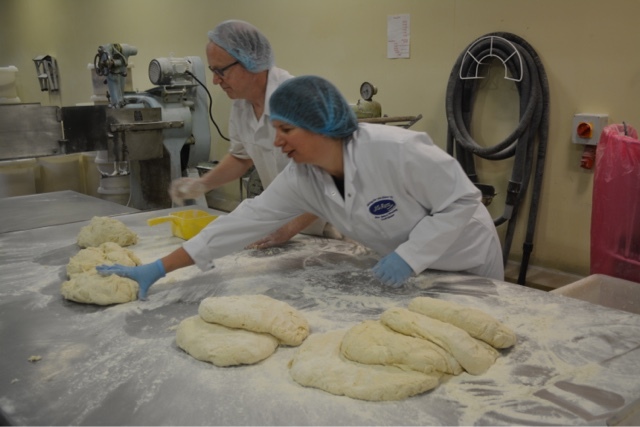 Traditional recipes, ingredients, skills and most importantly hand crafted methods are what make them a Craft Baker rather than a mass producing factory bakery. A second generation family business, under the watchful eye of the founder Mr Ross, they produce to quality rather than price and will always work that way. Local butchers and producers supply them with meat, oats and rapeseed oil and they take pride in serving the local community. Throughout my visit I was amazed at how extremely hands on everything was and impressed with the skill, passion and pride that all the staff showed in their work. I donned my glamorous white coat and shoes and coordinating blue hairnet and gloves (essential due to my nail varnish - you don't want any of that in your buttery!) The dough had already been made and was waiting my arrival. The batch that I was baking were vegetarian so no lard in them. 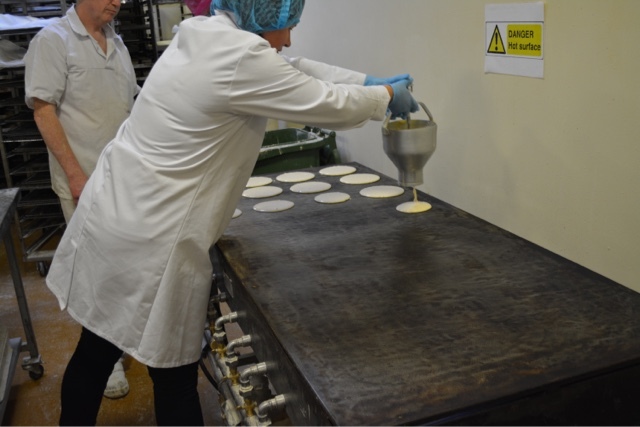 There are no secrets behind the buttery's few humble ingredients – flour, yeast, water, fat, sugar and salt. Alas Foreman Baker Roger Cooper wasn't about to reveal to me the quantities and proportions of each that go into a JG Ross Buttery. 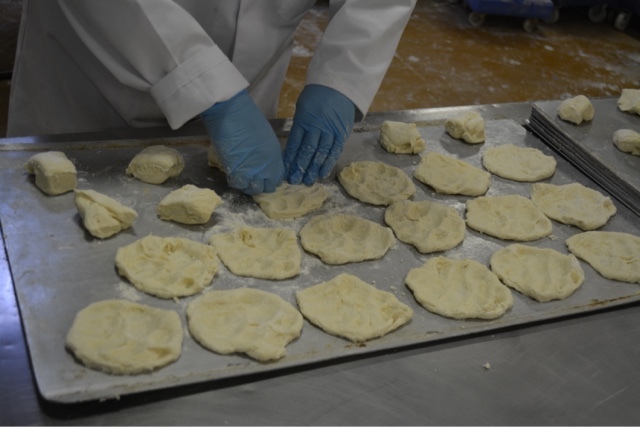 Everything is combined by hand in a very physical process to make a soft and sticky dough. It was at this point that I was let loose to form the 2kg lumps of dough into balls ready to go through the hand divider which formed 36 equal pieces. 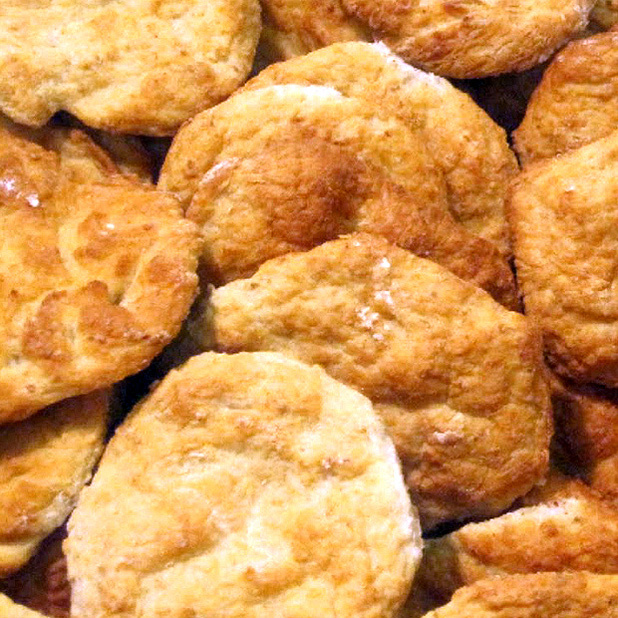 24 Butteries went onto each tin and were pressed out into their traditional shape. Every dimple on the top of one is created by fingers and knuckles on a human hand. Not something that any machine could ever successfully replicate. Into the prover for 40 minutes so the heat and humidity can work their magic before heading into a very hot oven to bake for 12-14 minutes. The smell at this point was amazing. In fact it was the first thing I noticed when I got out of my car in the car park however all the staff told me that they quickly became oblivious to it. With the butteries cooling it was time for my next task. Large American style pancakes. With the pancake batter already prepared all I had to do was cook and flip. How difficult could that be?! Two squeezes on the handle of the batter dispenser deposited exactly the right amount of mixture for a consistent size. I'm going to have to get me one of these for home. Roger demonstrated a batch of 8 pancakes and then it was my turn. But I had to fill the whole hotplate. It really was hot work. I reckon I didn't do too bad for a first attempt although I did have a couple that were a wee bit too close together and another spilling off the edge. Flipping was done with what looked to me like a wallpaper scraper. It did the job much better than a palette knife. Something else for my wish list. After a shaky start I managed to get into a bit of a rhythm and discovered that approaching the pancakes from the side rather than the front was the way to go. The final part of the process requires asbestos fingers. 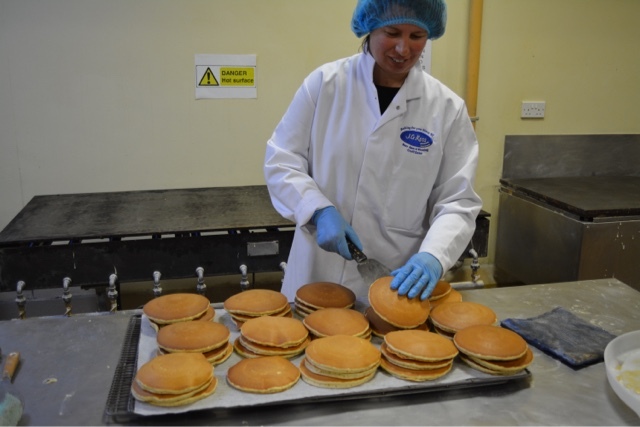 Collecting up a pile of four hot pancakes in one hand and transferring them to a cooling rack. If I'd have known that I'd get the stack of dodgy ones to take home with me I'd have made more mistakes. My next task was to decorate a celebration cake. This was undoubtedly the part of the visit that I was least looking forward to. I'm a reasonably proficient cook and baker but simply don't have the skill or patience for the pretty stuff. This did not bode well. Confectioner Cheryl Cooper, Rogers daughter, showed me the ropes and let me loose with a piping bag. I simply don't do Birthday Cakes for my children. Supermarket novelty cakes all the way. But with my daughter's 11th Birthday only days away I couldn't miss out on the opportunity to ice her a cake. Pink was my colour of choice although the final hue was somewhat more vivid than the look I was initially going for as I was a bit heavy handed with the gel colouring. After attaching my ribbon, Cheryl demonstrated on the work surface how to ice around the base. She made it look so easy. My attempts looked very amateurish in comparison. I decided just to go for it and with the cake on the turntable I managed a full circle of pink and white. Next up the writing. Lets just say that the photos make my efforts look rather better than they did in real life. My hands would just not stop shaking but I managed to fit all the letters in, spelt everything correctly and kept it all reasonably straight. Really glad I gave my daughter a short name. More piping round the top to finish it off before being let loose with a lustre spray to make it all sparkly and professional looking. Kinda like a soft focus for cakes. My final job for the morning, before I could actually eat some of the fruits of my labours was a short stint on packaging and labelling section. Time to remove the hairnet and gloves and hand back my white coat and shoes before heading down to the Coffee Shop. 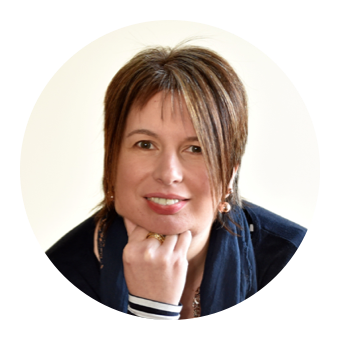 Over a pot of tea and a warm buttery with homemade raspberry jam Marketing Manager Dianne Smith filled me in on some of my unanswered questions. Firstly the thorny subject of exactly how calorific a buttery is. Clearly not all butteries are created equal, but for JG Ross ones I was surprised (and a wee bit delighted) to learn that they shape up as follows: Buttery 181 calories, Banffshire Buttery (made with locally milled oats, 15% less fat & 20% less salt) 163 calories, Veggie Buttery 152 calories. In comparison a JG Ross oven scone is 212 calories and a Mars bar is a whopping 280 calories. 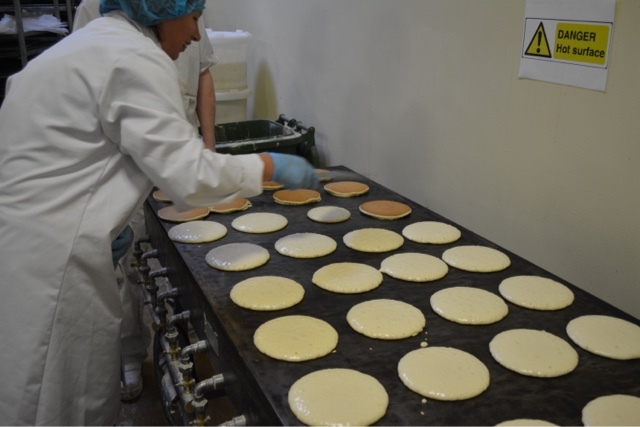 150,000 Butteries are produced every week on average by JG Ross. This includes their popular Friday speciality Butteries which rotate between Haggis, Bacon, Cheese and Cheese & Bacon. 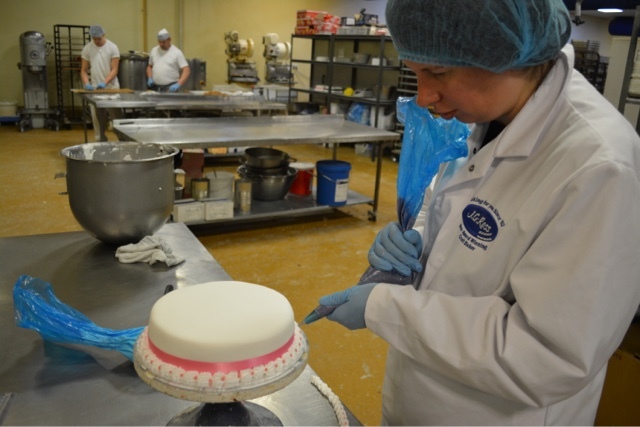 During the upcoming Craft Bakers Week, JG Ross will be highlighting their handcrafted products and using it as a focus week to show the heritage and the traditional methods and tools that they use. From what I saw during my visit they have every reason to be proud of their passion and history. Long may they continue with their slogan Baking for you since '62. 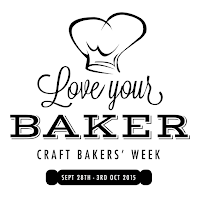 The nation’s bakers are calling on the public to show them some love during this autumn’s Craft Bakers’ Week (28th September – 3rd October). This national celebration will showcase the skills bakers use every day, to make a host of foods including breads, cakes, pies and more. 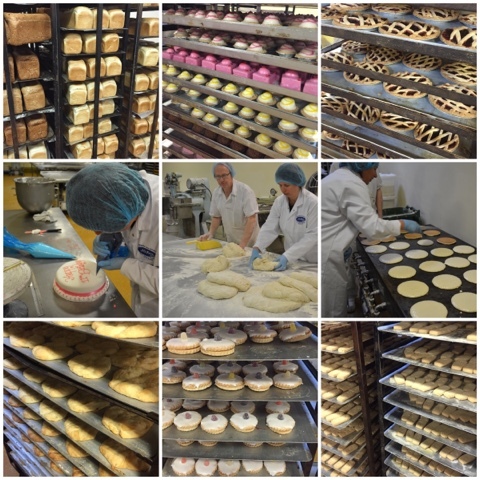 Bakeries have been a feature of many high streets for generations and businesses are often passed down through the family – along with baking know-how, regional specialities and even secret recipes. 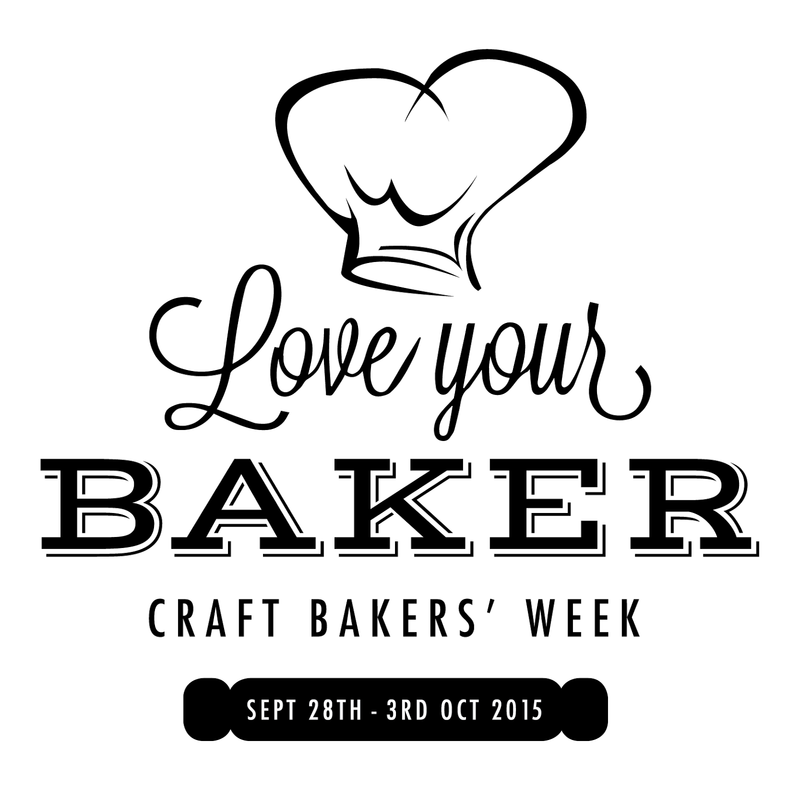 Disclosure : This is a sponsored post commissioned by Craft Bakers Week. All views expressed are my own. Many thanks to JG Ross for facilitating my visit. Perhaps we could suggest Kale Butteries for on of the Friday specialities. That would definately be a health food! Will aim to stock up on Haggis ones for Christmas. JG Ross deliver them worldwide to homesick Aberdonians! Glamour all the way! If I'd been in the sandwich section my hair net would have been green and for meat products they are red. Vital for food hygiene of course and you don't feel so stupid when everyone else is wearing them! Well done Claire! 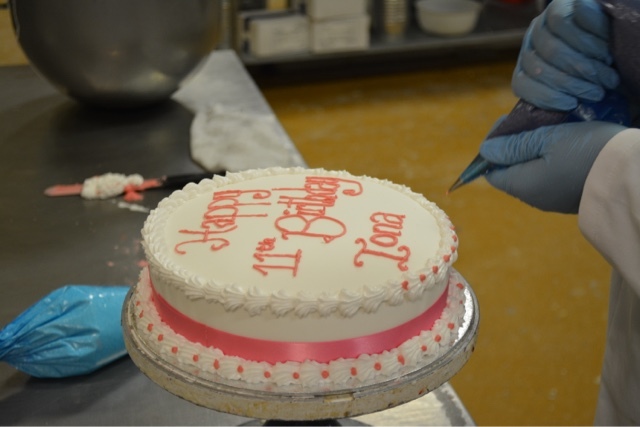 You made a great job of the butteries and your cake decorating skills are obviously better than you think! Thanks Janice but all the credit must go to Dianne who took the photos of my icing from a very flattering angle. Looking from above it was rather wonky! What fun! I had no idea they made Veggie Butteries, I've only ever tasted ones I've made myself and wondered how authentic they were - time to track these ones down! Yup they definitely exist! Good luck in tracking some down. JG Ross make them for Scottish Tesco Stores. Goodness that all looks really interesting. I am so impressed at how uniform those pancakes are. Looks fascinating. It was such an interesting morning. I couldn't believe how hands on everything was. That's the difference between craft bakery and factory. I was pretty impressed with my uniform pancakes too! That looks so interesting - I love the sound of butteries and may dispatch my Scottish friends to bring me some when next they're home. Your icing on the cake is so tidy! I'm appalling. I'm beginning to feel quite proud of my icing skills after all these lovely comments! You definitely need to try a buttery if you get a chance. Sounds like a really fascinating day (although it looks like hard work!). The way you described the butteries I assumed they would be stupidly high in calories, but they're actually not bad at all. I'll have to see if I can find some more locally to give one a try. Your icing looks great, if it was a bit wibbly you've hidden it well in the pictures. I hope Iona liked her cake. It was lovely to meet you at the River Cottage, I hope I'll get to see you again at another event. It was an amazing insight into the work of a craft bakery, you must try a buttery if you ever get the chance. Lovely to meet you at River Cottage HQ too.